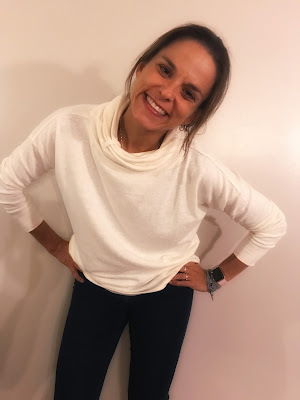 I received two items of clothing from prAna to review. All opinions expressed are my own. A gorgeous beautiful time of year. The trees begin to change. Nights are cooler. I freaking love fall. I'm back to school. Structured days. Crazy busy. Teaching all day, coaching in the afternoon. Then getting my kids to where they need to be - soccer games, soccer practices, dance. But I absolutely love it. In addition to the gorgeous clothing, prAna makes, they focus on making sustainable clothing. prAna makes clothing that is Fair Trade and uses recyclable materials and hemp. Doesn't that make you feel good? I know it makes me feel good about choosing prAna! Penelope Pullover I've always loved the name Penelope. It's a beautiful name that sounds inviting. The Penelope Pullover is definitely inviting. It's amazingly soft. The color is a warm cream. The cowl neck is my all time fave. I want to live in this shirt.